How often does your practice take time out to think about how to grow and how to keep up with the digital trends of today? The first ever, EyeInnovate 2018, conference was all about marketing and technology specifically for eye care doctors, groups and optometrist students looking to get into the field. There were 300+ people there to spend the day talking about innovative ways to grow their practice. Some of the topics covered were fairly technical so don’t feel bad if your practice isn’t doing all of these things today. This one might seem obvious at first, but there are many ways to help your practice be the first on the search page list. The conference went in depth into several areas but for brevity sake, here are a few ways to get to the top of your search page. Google AdWords – place ads for your local area so that you show up first in your google search and test out different words. Do your customers search for “eye doctors”, “glasses”, “eye exams” etc. (there are plenty of resources out there that can help you set this up, Marketing4ECPS.com is one that can help). Search Engine Optimization – make sure you are using a consistent address in all online areas so that Google can easily identify your practice and all of the different website pages that belong to you. For example, your website, your Facebook page, your Google business page, etc. We offer an automated service called Reach that syncs content across all channels saving staff a bunch of time, plus adds rich content to highlight important aspects of your practice. Google Youtube Ads – Did you know that Youtube search is the second most popular search? If you are into doing video ads, you can put them there and even if your audience skips the ad, there are 5 seconds they have to watch, so get your message in that first 5 seconds! Must load quickly – So many people will exit immediately if they don’t see your page loading quick enough. Must be mobile friendly – People are on the go and they don’t wait to get to their computer to find answers to their eye questions, or find an eye doctor in their area. Must have quality content – your office has a wealth of information to draw from. Put all those frequently asked questions online. Take time to pull together information about different eye conditions and let people know what to expect when they come meet with you. Put pictures of you and your staff in the about section. Must be easy to contact – Get the technology to allow people to schedule appointments online, maybe even chat with your patients. At a minimum, make your phone number clickable on your website, so that they can use their cell phone to call you with a click of a button. Decide what you are all about – If it’s fashion glasses? Then make sure you follow trends and have stock to back that up. If it’s a specific ailment? Then make sure your website has all the answers to your patient’s common questions about that specific problem on your site. In other words, if you try to be everything for everyone, you’ll be nothing to no one because you will blend in with the 10 other eye care practitioners in your area. Merchandise properly –The experts recommended that you provide well-lit backgrounds and clear branding because many people don’t realize that you carry the brand of glasses that they are looking for. They also recommended digital displays, which can really take your merchandizing to the next level. Engage with online social media – Look for online groups and provide them with all your specialized content and mission of your practice. Reach out to leaders in these groups and build relationships with them. They will often help spread the word that you are an expert your chosen area. I’d venture to say that there was one thing that was left out and it was to make your products easy to buy. People can order just about everything online these days, and they will shop elsewhere if they can’t do it with you. Take contact lenses for instance. One-day lenses are by far the healthiest for your patients, but they can be expensive and often the patients simply can’t afford a 6 month or 1 year supply all at once. If you could offer them an easy way to have a monthly subscription payment and have the lenses delivered to their door, most people would take it. Plus, with a subscription platform like LensFerry, all they have to do is reply “yes” to a text message that reminds them when it is time to reorder. Learn more about how LensFerry could give your patients the convenience they are looking for, and give your practice the advantage. 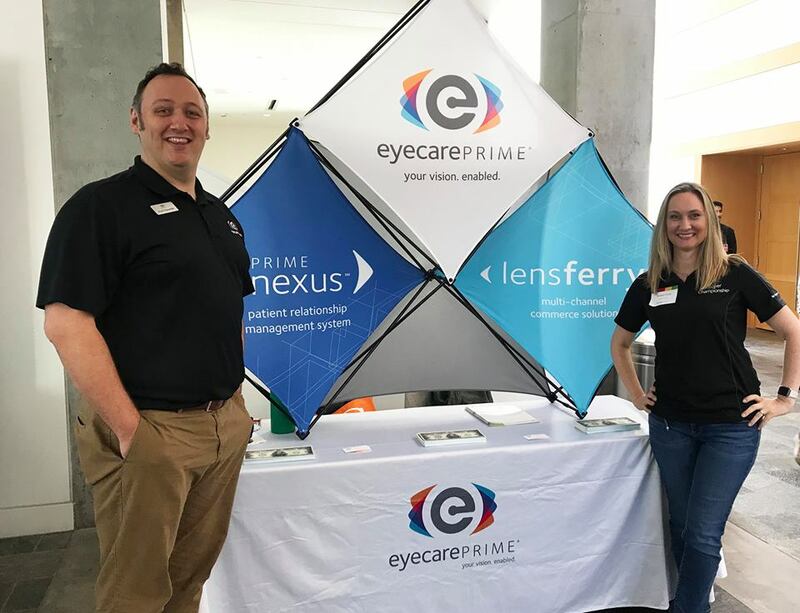 Overall, EyeInnovate 2018 was a great experience. I’m looking forward to going again next year. Hope to see you there!